Ah Italia – the land of good food, wine and amore. Italy is a destination that attracts some 50 million visitors a year, and with good reason – foodies, history buffs, art aficionados, nature lovers and beach bums alike will find something to see, do and love about it. There is a lot to take in, so planning a trip to Italy can feel like a daunting task, especially if you’re short on time. Having planned many a trip there, I’m happy to offer you a helping hand in putting together the best Italy itinerary to satisfy the most whimsical of first-timers, covering almost all bases. We’ve also added our essential insider tips to avert some of the culture shock and small annoyances that come with traveling in the Land of Love. A trip to Italy for first-timers will not be complete without a visit to the Eternal City – home to one of the Seven World Wonders, the Colosseum, the city-within-a-city and highest seat of the Catholic Church, the Vatican, and a myriad of other attractions. We recommend that you dedicate two days of your itinerary to Rome, giving you ample time to cover the east and west sides of the River Tiber which lops the city in two. Spend your first day in the east – visit the Colosseum, Palatine Hill and the Roman Forum, stroll to – and don’t forget to throw a coin in – Trevi Fountain, browse around the markets of Campo di Fiori, and rest on the Spanish Steps. If you’re an art aficionado, don’t forget to visit Villa Borghese, set within a beautiful park. On your second day, head to the west – home to the Vatican and one of the more laid back neighborhoods to soak in the atmosphere of the Italian capital, Trastevere. In this part of town, we also recommend climbing up Gianicolo Hill which provides a great viewpoint for Vatican City and makes for excellent shots of the capital. For a laidback afternoon, walk around and dine in Trastevere neighborhood: trendy restaurants, iconic traditional houses and unique local charm make this the perfect place to wind down and end your time in Rome. Book your tickets in advance: make sure to buy your tickets to The Colosseum in advance. Coopculture is a reputable place to buy these, and is available in English. Remember, these are not tickets you’ll be picking up at the counter (and the whole point is to save time skipping the ticketing queue), so you will need to print these out in advance. If you’re especially interested in the Colosseum and its 2000 years of history, we recommend you book a tour. Tours can run from 1 to 3 hours to cater to both those in a hurry and those after an in-depth introduction. Your tickets to The Colosseum include entry to Palatine Hill and the Roman Forum. Get the most out of the Vatican: Vatican is a small country with a big influx of tourists. It gets incredibly busy and crowded any time of the day, all year round. This is why we recommend an out-of-hours tour to make the best of it. There is early-entry tours all days of the week, and after-hours tours on Fridays. We recommend Dark Rome’s First Entry tour for those interested to see the Vatican before the crowds pour in, and Context Travel’s Night Tour (Fridays only) for those really interested in learning more about the pieces in the Vatican Museum, and the history behind the Sistine Chapel. Spend a little more, and you’ll be in a small group of only 8 or 10 people. Mingle with the locals around a dining table: meeting the locals? In Rome? It may seem like a mission impossible, but Rome is one of the fastest-emerging cities on EatWith’s global dine-with-a-local map. It’s simple: a local is hosting a dinner at their home, and you can sign up to take a seat at their table, in their home. It’s a fantastic way to explore Roman cuisine, meet some great people (locals and other travellers), and avoid a generic restaurant meal. Florence, the iconic renaissance art city is every art buff’s dream come true. Accademia and Uffizi are two of the country’s world-renowned galleries, home to Michelangelo’s David and a series of works of art you won’t find anywhere else. Not so much into art? Florence has a lot more to offer: The Duomo is perhaps Italy’s most famed cathedral, and we guarantee that you will recognize its dome from pictures of Italy you’ve seen before. Pop in at San Lorenzo markets – a concoction of several interlinked markets selling everything from food and groceries, to souvenirs, Italian leather goods, and more. It’s a great place to stock up on goodies you’d like to take home, plus they have a delivery service for items that you won’t be able to carry – especially things like wine and olive oil which you may wish to stock up on in advance. Florence is the quintessential Italian city – small, walkable and undeniably charming. We would recommend spending a full day here to see everything it has to offer. Florence is also the gateway to Tuscany – arguably the most charming Italian region, iconicized for its winding countryside roads such as Via Chiantigiana, vineyards and olive groves, sprawling green vistas, historic castles, charming villages. The list goes on! Stay in a Tuscan castle: Tuscany is dotted with castles and villas dating back centuries. They offer a rustic accommodation experience hard to compare to anything else. Imagine driving down winding roads, past vineyards and small, sleepy villages, and pulling up to a 12th century castle to call home for the night. This is the true Tuscan experience. A more cost-effective alternative to castles is something the Italians call an “Agriturismo”. Agriturismos are in a sense homestays, still very much rustic, within a property that also makes its own products (wine, olive oil, cheese). Visit a winery and/or farm: when in Rome, do like the Romans. When in Tuscany, drink wine. The region is perhaps best known for its wines, but Tuscany produces and exports many more of Italy’s famed goods: cheeses, olive oils, truffles. And for each of these, you can visit a farm or a winery and experience the process by which they’re produced, taste the final product, and take some home. Some of these wineries are centuries old and follow old processing methods. Some are brand new, having been around for some 15-20 years, using new techniques and living through their own wine renaissance. Take a Tuscan cooking class: cooking classes are so in right now! 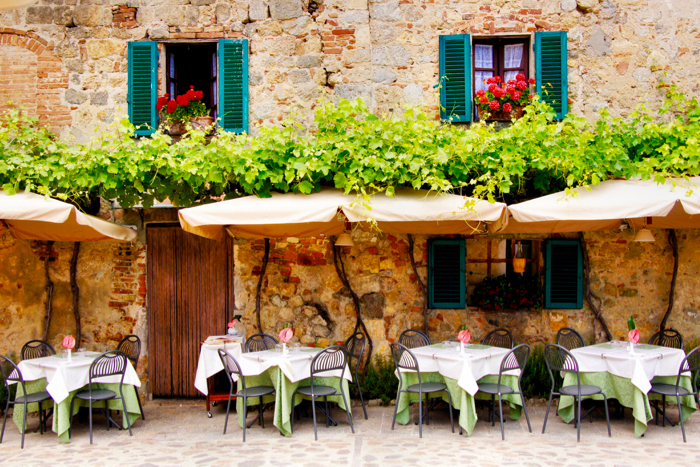 If love truly passes through the stomach, nowhere else is this more true than in Tuscany. Local cuisine is actually fairly simple, having emerged based on the availability of local products and the swiftness needed to cook for a big (Italian) family. The secret to Tuscan cuisine is making incredibly simple, yet incredibly delicious meals. You will drive to a remote village in the Tuscan countryside, meet your chef and a small group who will be your learning companions. In the end you will walk away with a full stomach and some new cooking skills to demonstrate to your friends and family back home. Get on a gondola: gondolas and gondoliers are to Venice what cabs and cabbies are to New York. Instead of following the general tourist trail and booking an overpriced gondola ride (which you should anyway, we’re not saying that you shouldn’t! ), why not learn how to row a gondola? You can book a brief course that will give you hands-on experience of standing at the helm of Venice’s waterway taxi. Venture off to Murano and Burano Islands: the Venetian lagoon includes a series of small islands, easily reachable by ferry. Murano and Burano are both famous for their respective crafts: glass blowing and lace making, and life seems to almost revolve around these. Escape the crowds of Venice to one of these islands for half a day during your stay and enjoy a different perspective on the city. A night at the opera at Teatro La Fenice: what is one thing Italy is so famous for, that we are yet to cover in this week-long trip itinerary? The opera! Teatro La Fenice in Venice is an iconic venue for some of Italy’s best opera and ballet acts. Come here and end your visit in style with a classic show. Plan ahead: prices for train travel in Italy fluctuate much like they do for air travel. The rule of thumb is – book early, and you’ll get a better deal than booking last minute. In fact, booking last minute at the station for long journeys between the big cities is likely to cost in the hundreds (we kid you not!) and definitely three or four times more than if you book in advance. Italy has several train providers, including the national TrenItalia and Italo Treno. We highly recommend the latter – they are cheaper, and their customer service is available in English and is generally outstanding, especially by local standards. Be prepared for unpleasant changes of plan: Italians are known for their complicated affinity for workers strikes. When news of strikes are being reported, Italians would say “eh, what’s new? !” – that’s how common they are. Strikes can happen anywhere (locally or nationally), at any time, and can thus cause serious disruption to travellers with tight, inflexible itineraries which not even the best Italy itinerary can solve. It’s a good idea then to leave some room for error, have the contacts of the service providers you’re using, and consult them right away. You are owed full refunds where services are cancelled or severely delayed. Go with the flow: Italy is a laidback place, and that is why we love it so, but with that come certain drawbacks. Good timing, perfect accuracy, skilled customer service (especially in a foreign language) are not exactly top priority. If you’d like some extra help and assurance, book your services via foreign vendors (for example, rent a car through AutoEurope as opposed to directly with Europcar) – this will make it easier for you to deal with any potential issues.